Final preparations have started for the next phase of tram works in Edinburgh, which is scheduled to begin at the weekend. Traffic management plans for the construction include a new diversion for buses at the east end of Princes Street. The Mound will re-open to taxis, buses, cycles and emergency vehicles. The city council has thanked the public of Edinburgh for their "continued patience" during the work. In this phase of construction, work sites at Shandwick Place and Haymarket will be extended to include West Maitland Street. We would like to thank the public for their continued patience while the work continues. 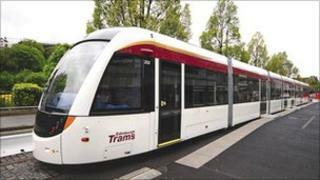 Cllr Gordon Mackenzie, Edinburgh's transport convener, said: "Following the successful mediation last year, progress with the Edinburgh trams project has gone well. "The on-street works are difficult for the city, businesses and travellers in particular, but the progress is evident and it's important we build and improve on that where we can." Edinburgh City Council has said that residents and businesses have been updated on the arrangements via a series of briefings in recent weeks. It pointed out that businesses affected by the works will continue to receive support through the "Open for Business" budget. Cllr Mackenzie added: "We would like to thank the public for their continued patience while the work continues. "The diversions and traffic management that was put in place earlier in January bedded in well and every effort is being made to ensure that will also be true on the occasion."